If you are interested in participating in this focus group testing, please contact Watson Library at business@library.columbia.edu, and we will forward your information to S&P. This entry was posted in Databases on March 25, 2019 by Michael. 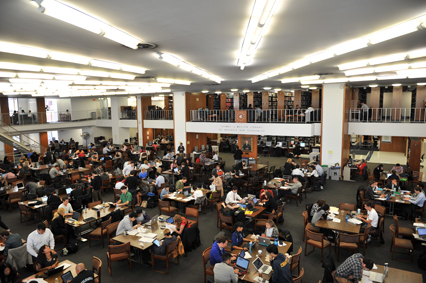 If you are not a Business School affiliate , but are currently affiliated with Columbia University, you can visit the Business and Economics Library where it can be accessed at 7 stations and/or the one station where it is available in Lehman Library. If you have problems locating these machines, please ask at the service desk at either location. Additionally, you can contact our research librarians at 212-854-7804 (weekdays 2pm – 4pm) or via business@library.columbia.edu. This entry was posted in Databases on February 19, 2019 by Michael. In case you experience problems accessing the online version of Financial Times (FT.com), please be aware that the Columbia University Libraries are working to fix this issue. This entry was posted in Databases, Journals on December 4, 2018 by Michael. Tomorrow (Thursday, Nov. 15th) at 11 AM ET, S&P Global is conducting a general FREE Excel Plug In Basics webinar session for 30 minutes. Here’s the link to register and more details below. Only registered attendees can join. This entry was posted in Databases, Instruction on November 14, 2018 by Michael. Capital IQ accounts have been activated for all 1st year MBA & EMBA students as of this morning. Standard & Poor’s Capital IQ is a single source for a powerful array of financial data, analytics and research. Our web-based platform combines deep information on companies, markets and people worldwide with robust tools for analysis, idea generation and workflow management. Active returning MBA & EMBA students should have had their access reinstated as well. If any questions come up regarding access or use of Capital IQ, please contact us at business@library.columbia.edu. This entry was posted in Databases on September 7, 2018 by Michael. This entry was posted in Columbia University Libraries, Databases, Instruction, research help on August 30, 2017 by Ignacio Sanchez. Investor Activism data template on Capital IQ! In partnership with S&P’s Investment Banking team, Capital IQ just released a new template called Investor Activism for the S&P Capital IQ Office plug-in. Investor Activism data is a popular, high quality data set that has been available on the CIQ platform for years. Many S&P Capital IQ clients, in particular in the corporate, investment management and investment banking segments, have asked to also have this data available in the Excel plug in. Clients can now enter a subject Company ID or Activist ID and see all the campaigns against or initiated by that company. This entry was posted in Databases on June 26, 2017 by Chubing Tripepi. Thomson One is a useful database for financial data on public companies, as well as merger and acquisition information and market data. 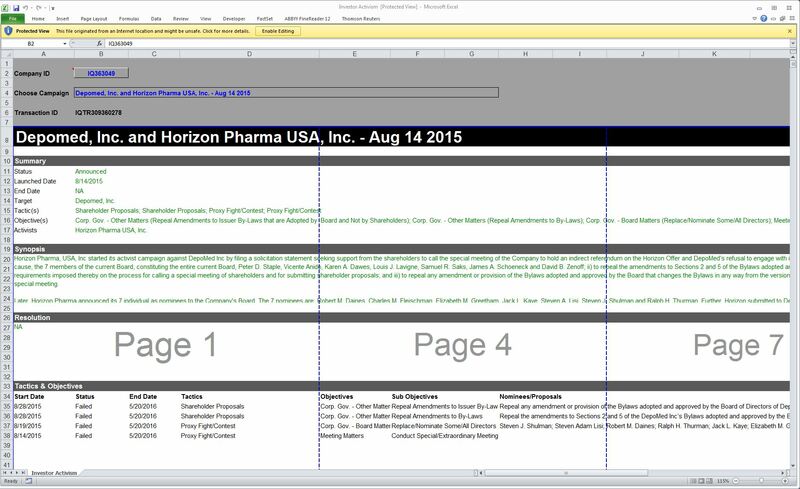 Users can search and screen across databases to identify companies that meet your specific investment criteria as well as conduct peer analysis. Includes Investext, Private Equity database (Venturexpert) and Thomson Deals (SDC Platinum). However it proves to be difficult because of its compatibility with only Internet Explorer (IE) pre-version 10. However this is a workaround with an extension/Addins for Chrome/Firefox. Please note that not all functions are supported with this solution (i.e. downloading analyst reports). Please note, this information was gathered from a various business libraries. This entry was posted in Columbia University Libraries, Databases, Uncategorized on February 9, 2016 by Ignacio Sanchez. Economatica provides balance sheet, stock market, investment funds and government bond analysis for the United States, Argentina, Brazil, Chile, Colombia, Mexico and Peru. This entry was posted in Databases and tagged Databases on November 10, 2015 by Kathleen. Bloomberg BNA, a subsidiary of Bloomberg, provides legal, tax, regulatory, and business information. This entry was posted in Databases and tagged bloomberg, database on July 15, 2015 by Kathleen.